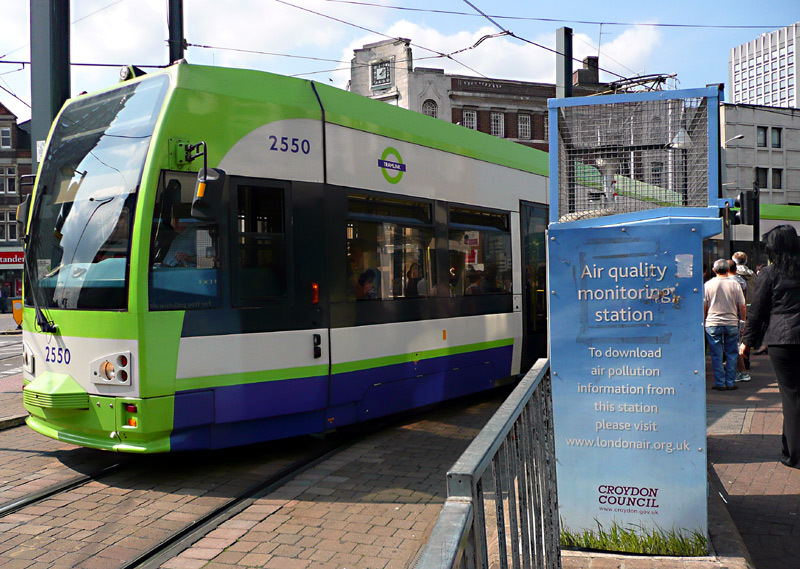 Electric railways already exist in London, as do trams / light rail in some selected areas; however only the Croydon Tramlink system sees the electric transports travelling within the street environment - which is where the most serious urban air pollution is to be found. This page advocates zero-emission electrically powered trams and trolleybuses as representing a significant part of the solution. as our many (similarly powered) urban electric railways. by the various authorities the issue of air pollution only receives token interest - the metaphorical "lip service". According to a report published by the Chartered Society of Physiotherapy - CSP - the PM10 air particles which are emitted mainly by diesel engines pose such a serious threat to public health that the World Health Organisation (WHO) believes there is NO SAFE exposure limit. The CSP's analysis revealed very high levels of this dangerous pollutant - not just in London but throughout the UK. §Proof that diesel buses are part of the problem comes from a 2011 air pollution study conducted by the Transport Research Laboratory (TRL) on behalf of the London Borough of Wandsworth which found that despite representing just 10% the traffic flow the buses which travel along Putney High Street contributed over two-thirds of the NOx emissions and 21% of the particulate (PM) emissions! 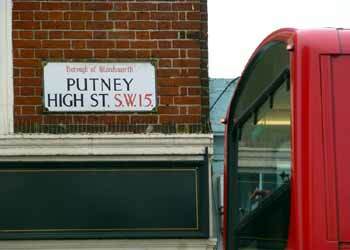 Buses in the very badly polluted Putney High Street - as described in the text above and below. and contributed to 14% of NOx emissions and 35% of PM emissions. In January 2016 Putney High Street became the first location in London to exceed its entire annual quota of N02 air pollution EU hourly limits. Under EU rules it is only permitted to breach these hourly pollution limits 18 times in an entire year. At 7am on 8th January the pollution monitoring facility on Putney High Street recorded its 19th breach of pollution limits. However this is not the whole story, since the air pollution monitoring facility on what is probably London's worst street for air pollution (Oxford Street) was offline all week due to a malfunction. 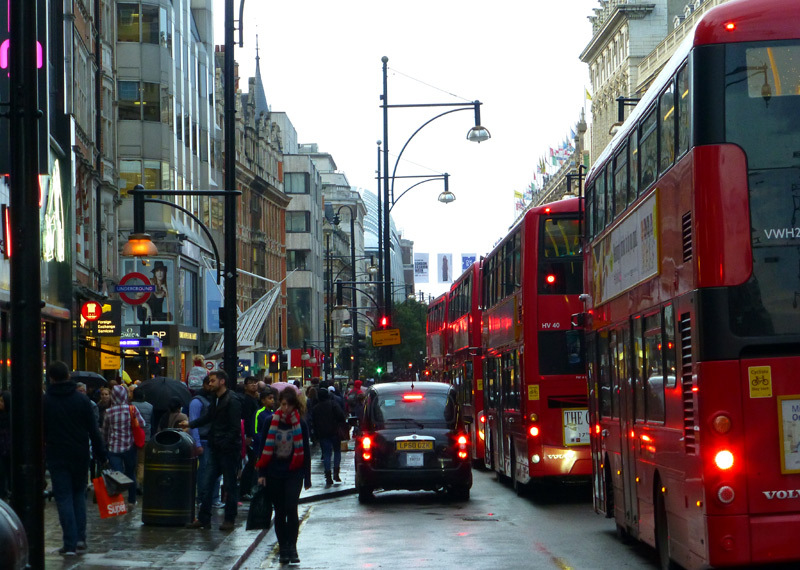 In 2015 it took just a couple of days for Oxford Street to breach its annual NO2 air pollution limit, and throughout the year it breached this limit more than 1000 times! The hourly EU limit is 200 micrograms of nitrogen dioxide [NO2] per cubic metre. Nitrogen oxides [NOx - which includes NO2] is produced whenever combustion of hydrocarbons and oxygen occurs in the presence of nitrogen. It is a component of the waste gases emitted by diesel engines such as are used by lorries, buses and some cars. It affects lung capacity and growth. 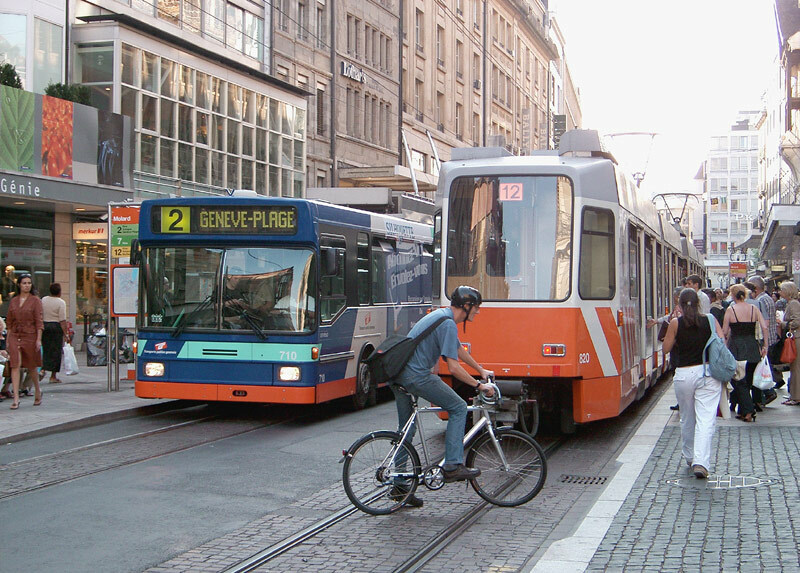 Zürich, Switzerland, where as part of environmental policies designed to protect the health of city-dwellers by minimizing urban air pollution motor buses are generally restricted to outer suburban and rural services. Trams (streetcars) are almost always electrically powered - indeed this feature is often touted as one of their major benefits - and there really is no reason why buses should not be equally city (and town!) friendly. It really is most strange that so many transport 'experts' (operators, environmental advocates, lobby groups etc.,) have double-standards with respect to air quality (or lack of) and bus / tram propulsion systems. There May Be Others As Well! That air pollution causes respiratory illnesses (including asthma) is well known. That air pollution causes heart disease is also known, albeit mainly heart attacks, although people with weak hearts are also vulnerable - suffering both non-fatal harm and complete heart failure. Perhaps less well known is that at least one of the components of diesel exhaust particulate (polycyclic aromatic hydrocarbon [PAH] called 3-nitrobenzathrone) is cited as a cause of cancer. Many of the most severe sufferers are our children, who when in the street environment are at the optimal height to breathe in large quantities of waste gases and particulate as they are blown about by passing traffic. It is no wonder that the incident rate of childhood asthma is now at a record high in our towns and cities. What sort of species is humankind - that it should place its next generation in such mortal danger? Do we (collectively) have a death-wish? pedestrian zone with the trams. A groundbreaking study published in summer 2015 conducted by Kings College for the Greater London Authority and Transport for London revealed that long-term exposure to urban air pollution was actually causing almost twice as many people than had previously been believed to be suffering ill health and premature death. Whilst the dangers of waste pollutants such as PM2.5 were already known, this is believed to have been the first time that scientists had looked at nitrogen dioxide (NO2) with the desire to discover whether long-term exposure to it also impacts human health, and if so, how seriously. N02 forms part of the waste gases emitted by diesel engines, such as used by cars, lorries and buses. It affects lung capacity and growth. 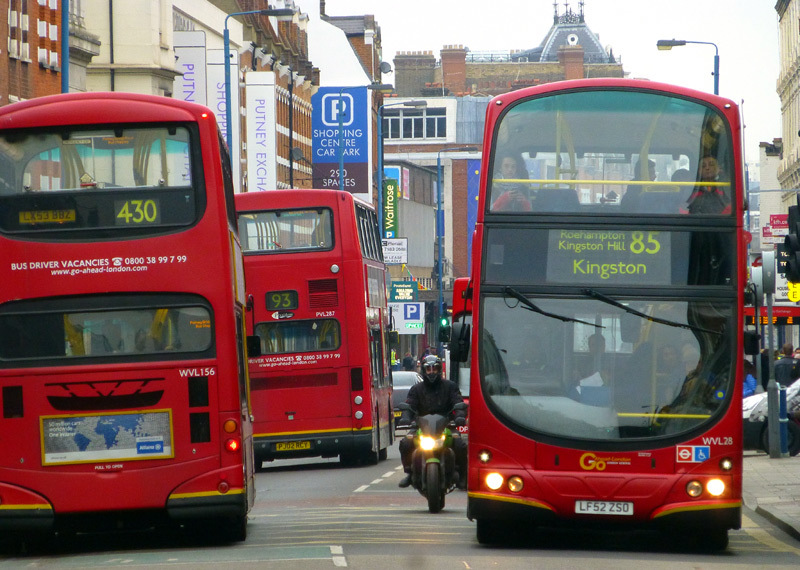 What Is London Doing To Reduce Air Pollution Derived From Buses (And Other Road Traffic)? It would not be right to say "nothing", as every possible effort (plus much money) is being spent on new-fangled unproven ideas - as alternatives to adopting the only proven viable solutions. Most people, not knowing any better, will actually believe that what is being done is the best that present-day technology permits. How wrong they are! In an effort to reduce emissions from all road traffic London's Mayor has introduced a "LEZ" Low Emissions Zone throughout the entire Greater London area which applies to just about all motorised road vehicles except private cars, motorbikes and small vans. Of course this is very laudable and there is no question that as a result there is some reduction in the not inconsiderable air pollution emitted by older vehicles which are no longer allowed to enter the LEZ (or must pay a very steep daily entry fee). For administrative convenience it is easiest to think of the LEZ as being within the area within the M25 Orbital motorway, although the motorway and London's political boundaries do not exactly coincide and to the east there is a small area where the LEZ extends outside the M25. The M25 itself is an exempted road. The Mayor has also taken action to reduce emissions from taxis, such as requiring that since 2012 all new taxis must meet the Euro 5 pollution standard and on the assumption that the oldest taxis are the most polluting taken action to prevent their being used in London. This has not been as successful as had been hoped, with some taxi drivers being forced into early retirement and allegations within the taxi trade that some of the older taxis actually emitted less of some types of pollution than the newer taxis which replaced them! From 2018 all new taxis will have to be capable of operating in zero emissions mode, even of only for part of the time. Amid much publicity London has also tried small-scale fixes designed to trap harmful particulate (PM10), tyre and brake dust from passing traffic. 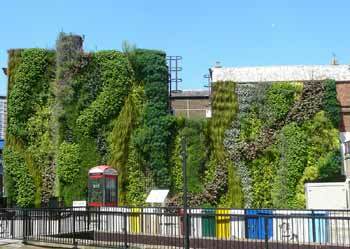 These comprise trials with living walls and spraying dust suppressants on to road surfaces. Whilst the results from these trails have proven to be very encouraging, suggesting that it would be worthwhile doing likewise at other locations too, these ideas still represent little more than public relations-style attempts to manage a bad condition - rather than cure an illness. The problem with the constant trials is that they push back the date by when liquid fuels stop being used as a frontline solution. because of the delay in actually taking action in the only way which really works? The south-facing wall at Edgware Road (Bakerloo Line) underground station which in a trial to test ideas that might reduce airborne pollution was planted as a 'green wall'. 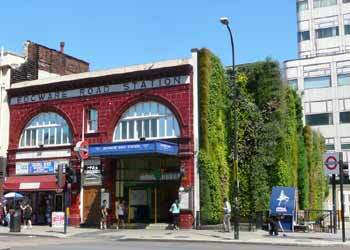 This comprises a variety of living plants that absorb some harmful pollutants. 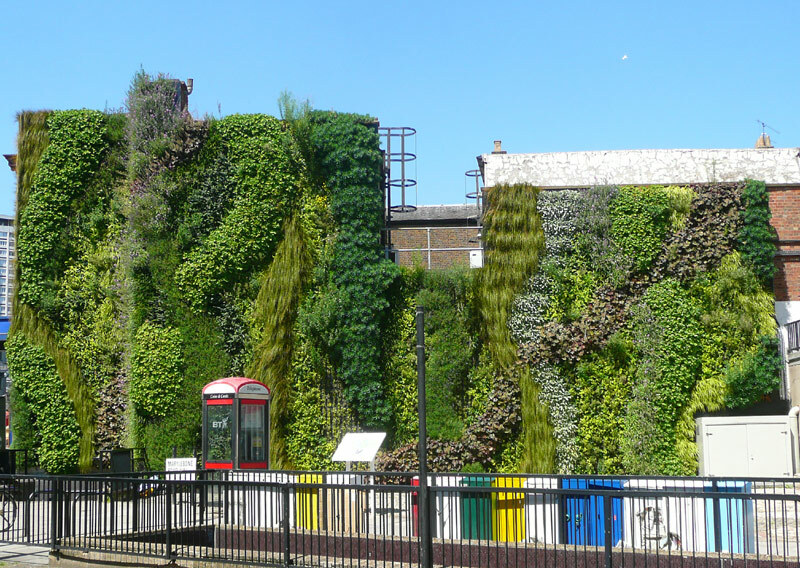 Whilst this has been found to be of benefit, and to be visually attractive, it did not meet with universal acclaim, with some people saying that it looks rather 'twee' and critics labelling it as representing environmental tokenism. 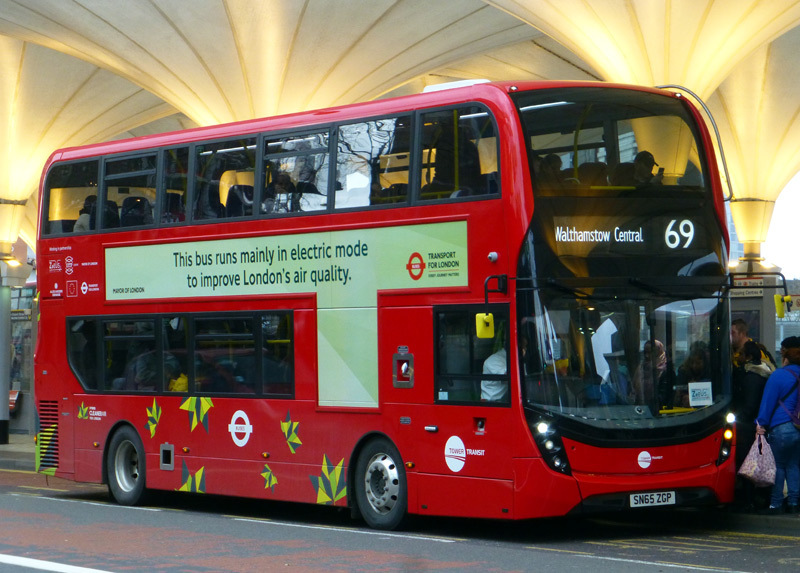 Actions to reduce total levels of the air pollution emitted by London's buses include a phased replacement of older buses with newer buses which have less polluting diesel engines that meet more stringent European pollution standards, the introduction of diesel hybrid buses which combine a diesel powered generator with a battery electric drive train, London taking part in multi-national experiments with Hydrogen Fuel Cell powered buses and trials with battery electric buses. In an effort to reduce the quantities of tailpipe pollution emitted by road traffic the European Union introduced a series of emissions standards which over time have become ever more stringent. These are known as Euro x with the letter x being replaced by a number that varies according the standard which is being adhered to. Many well meaning professional people have placed blind faith in these emission standards as representing a viable attempt to ameliorate the situation, however in April 2014 Mr Boris Johnson (who at that time was Mayor Of London) revealed that the Euro x scheme is actually a sham designed to hoodwink and placate as many unaware, uncritical, trusting people as possible. Writing in a newspaper column he said... "the motor manufacturers have been able to diddle the Commission: the cars and trucks have appeared to conform on the test tracks; but when it comes to everyday use, on real streets, it is a different story". The problem is that the tests are conducted on new vehicles (which have brand new engines that are in tip top condition) on test cycles on a test track - and NOT on real-world road traffic situations as per our streets. These standards also take no account of the fact that emission performance deteriorates as the engine ages - even with perfect maintenance. For 2015 a new standard called Euro 6 was introduced. This standard mainly targets two types of emissions: nitrogen oxides (NOx) and particulate matter (PM), with the aim of reducing these by 80% (NOx) and 50% (PM). But... with grid-powered electric trolleybuses these pollutants would be reduced by 100%, or in other words, totally eradicated. You cannot get cleaner than that! There are no such things as clean diesel vehicles. Just "less dirty"
A battery electric bus on trial in London. These buses work on short city-centre routes so even if used intensively they are unlikely to travel as much as 100 miles (160km) in the one day. This is significantly less than many buses travel on other heavier duty services. Some people see solutions in diesel-hybrid buses which couple diesel engines with an electric drive system that is powered by batteries. and then need replacing - at great financial cost! Battery Technology Not Mature Enough! Battery electric trams are even more rare than most endangered species... it is always expected that trams will be powered by direct connection to the national grid. Although the numbers of pure battery electric buses is growing they remain a niche mode of transport. The reason why they have not found favour for mainstream high capacity services is that real-world commercial experience has found battery technology to not offer a viable solution. In short, batteries cannot hold enough stored energy to power a large high capacity bus for a full day's work. Batteries are very heavy so getting around this restriction is not as easy as adding a few more batteries - at least not if the desire is to have a bus which can carry enough passengers, stay within legally mandated weight limits and also be commercially viable. 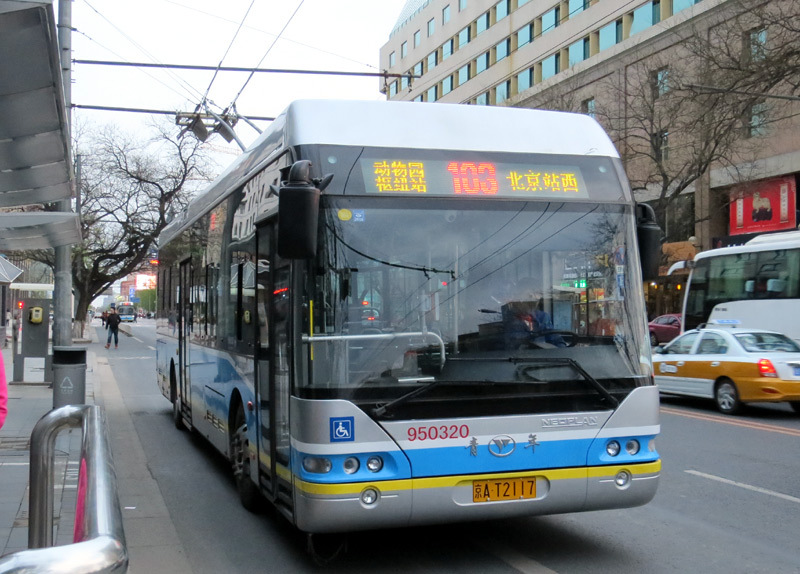 Whilst there is one Chinese bus manufacturer who claims otherwise, their vehicles only store enough energy for light service bus routes which travel up to 250km (155miles) a day - rather than the 350km (217miles) (or more) which some bus operators need. This is achieved by packing three tonnes worth of batteries into the bus - and as a result to avoid breaching the legal weight for two-axle buses they are only allowed to carry 69 passengers. By way of contrast the (same sized) diesel buses which are used on the same London bus routes are allowed to carry 96 passengers. To get around battery capacity limitations buses designed for stop-start urban routes often have battery-electric drive systems and a small diesel engine that is attached to a generator which can top-up the batteries as required. To minimise emissions the diesel engine will always run at its optimal speed / power setting and there will be times when the bus is operating in solely battery mode. 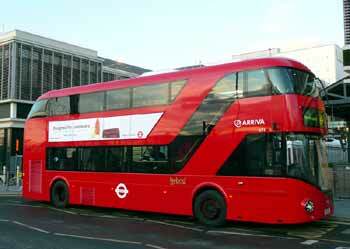 These are called hybrid buses. Because these use diesel engines they still emit harmful air pollution in the streets through which they travel. An idea designed to further reduce emissions within the urban area by extending the range the bus can travel in solely electric mode is daytime topping-up of the batteries during the layovers between journeys at the bus terminus. Called opportunity charging there are several variants of this system which include receiving power via direct contact from above the bus and induction power transfer from a special charging point that is flush with the road surface. The term opportunity charging can be defined as charging the batteries whenever the opportunity arises and in trials overseas has also included quick partial recharging at bus stops whilst en route. Of course such recharging is only possible at locations where the required infrastructure has been installed, and is available for use. In 2015 London started trialing opportunity charging (via road surface induction) some specially modified double-deck hybrid buses on the 9 miles (14 km) route No.69, the expectation being that - at first, when the batteries can still hold their maximum charge - these experimental buses will be able to travel for up to 80% of the time in battery electric mode, and for the remainder of the time they will rely on the onboard diesel generator to provide the required electrical power. They will also use their diesel engines if they miss a charging session, perhaps because the bus was running late and there was insufficient time for battery charging or because another of the experimental buses is already using the charging station. The three buses used in this trial have been nicknamed as extended range hybrids and virtual electrics. One of the experimental induction charged extended range hybrid virtual electric buses calls at Stratford bus station. 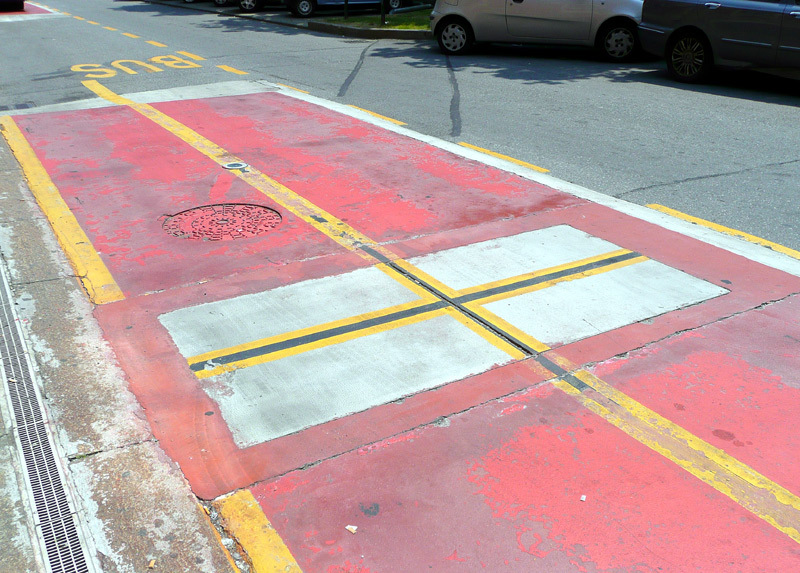 A road surface induction charging plate, as seen in Turin, Italy where induction charging as been underway for a number of years. London is not the first British city to trial induction charging - since January 2014 a midibus route in Milton Keynes has been using a fleet of eight pure electric buses which use induction to recharge their batteries. Before the battery buses took over this route it needed just 7 buses, but the approximately 10-15 minutes of extra time needed for charging the batteries when between journeys at the route termini means that more are needed. The fleet actually includes nine buses, one of which is diesel powered. This was added when it was realised that at busy times eight buses would not suffice. Another issue with batteries is that they only tend to last 5-7 years before their reduced ability to hold an electric charge makes them unsuited to power buses. Replacing batteries can be extremely expensive - when Rome, Italy faced this issue they found that the €30,000 cost per bus represented a serious financial headache. When New York, USA, faced this scenario they stopped buying hybrid buses and went back to diesels - the cost was just too much! Depending on battery type the safe disposal of life-expired batteries also poses environmental issues. There are actually several different types of hybrid propulsion systems, the version described here is the type that is most suited for urban buses on stop-start services. More information about these can be found on the citytransport.info website - there is a link in the links section at the bottom of this page. Of course buses are not the only sources of air pollution, even the Putney High Street air pollution report detailed near the start of this page also talked about the other road traffic - and it stand to reason that these need to be cleaned-up as well. Sending more freight by train (or even coastal waterway / inland canal) for final delivery by local area electric commercial vehicles would help to reduce both urban air pollution and traffic congestion - but even once the decision to do this has been made it will still take time for the cleaner alternative vehicles which meet the transport needs of the many commercial organisations and private people who use our roads to be designed, manufactured, tested and available to purchase. 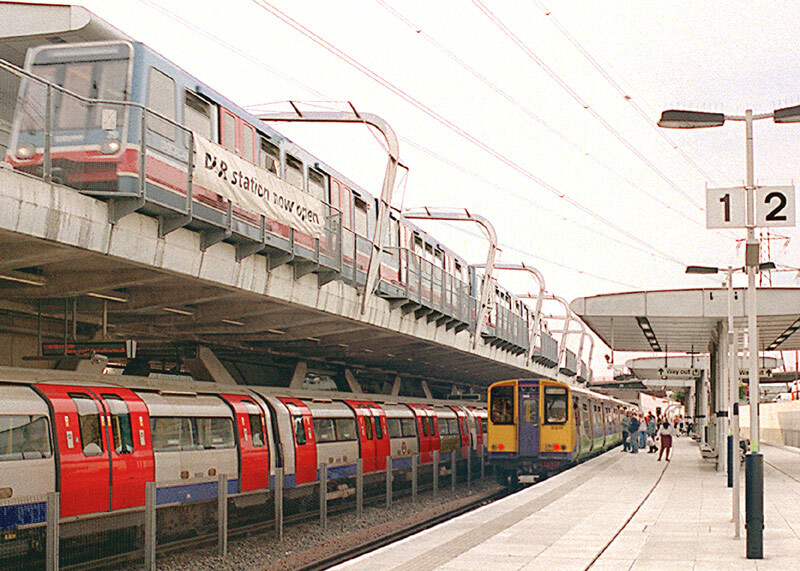 Another hurdle to overcome is that since the railway strike in the early 1950's which crippled British Industry (because no goods were moving) it has been Civil Service and Government policy for us here in the UK to have a road-based decentralised transport system operated by as many privately owned transport companies as possible. 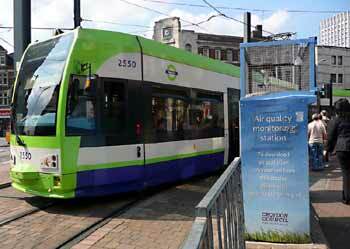 More tram services are very much part of the solution, however in the UK the process of achieving planning permission and installing the physical infrastructure takes decades - during which time people are constantly being assailed by the polluted air. Even cities such as Manchester which has the most extensive network of modern trams in the UK still has many bus services for which conversion to tramway will never be financially viable. Because trams run on steel rails they are usually seen as a rail-based transport mode, even though they can also travel on the public highway with other traffic. The only part of the road-based transport industry where all the required technology is available right now is the urban bus industry. As said above, the road freight industry is not yet ready to switch away from diesel fuelled vehicles. Neither is private motoring - although it probably will be quite soon. By way of contrast, electric buses are available to purchase 'today'. Another advantage which most urban bus services have is that they travel over pre-defined fixed routes, so electrical supply fixed infrastructure would only need installing on a small percentage of the entire urban road network. This makes converting buses to electric traction the easiest way to achieve a first stage quick win in reducing urban air pollution. Because of bus deregulation most local governments outside of London no longer have full control over bus services in their areas and therefore there would need to be enabling legislation which allows for the installation of power supply infrastructure which can be used by more than one local area bus operator and which allows the local government to stipulate that urban bus services must use that wiring. London is different, as here deregulation operates differently and instead the various bus companies must compete for the right to operate bus routes over which the Mayor still retains absolute control. 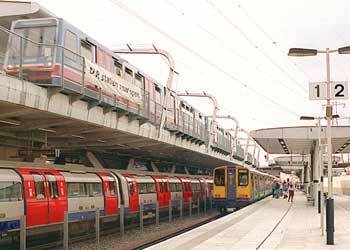 Therefore if (s)he and his (her) transport office (Tf L - Transport For London) really thought that air pollution was a serious issue they could take the necessary action to eliminate the urban air pollution from the motor vehicles over which they have direct control. IE: "the buses"! This would be by converting them to grid-powered 100% electric traction - either as trolleybuses or trams - or for low capacity quieter routes, battery electric buses. Permanent Connection To The National Grid Is A Proven Viable Solution! With trolleybuses the possibility will always remain that if there should be an emergency situation (such as a burst water main) then the bus is still be able to go around the obstruction - or even disconnect from the power supply and use its temporary onboard power solution to deviate via other roads. Electric Buses Are P o p u l a r With Passengers! In Arnhem, Holland the transport operators saw ridership increases in the order of 17% on routes converted from diesels on a "like-for-like" basis. Their five year "Trolley 2000" Trolleybus Rapid Transit (TBRT) strategy was conceived knowing that by using trolleybuses the number of passengers travelling by bus would rise by up to 21% higher than could have been expected using the best type of diesel buses. 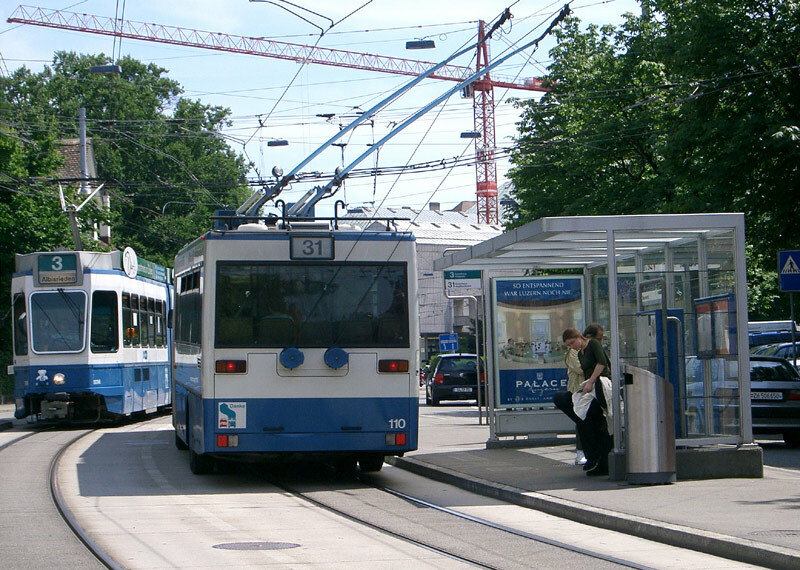 In Salzburg, Austria ridership increases have been 16% and the city is part way through a long term trolleybus expansion project with the intended aim of the near total elimination of fossil fuel powered buses from its streets. This is being done for environmental reasons. Salzburg, Austria takes air pollution issues seriously and is converting more diesel bus routes to electric traction, with the aim of a near total elimination of fossil fuel powered buses from its streets. This image shows one of the new (in 2012) Metro styled trolleybuses with a sloping tram-like front at the bus station which is next to the main railway station. Plus the trolleypoles from another trolleybus! 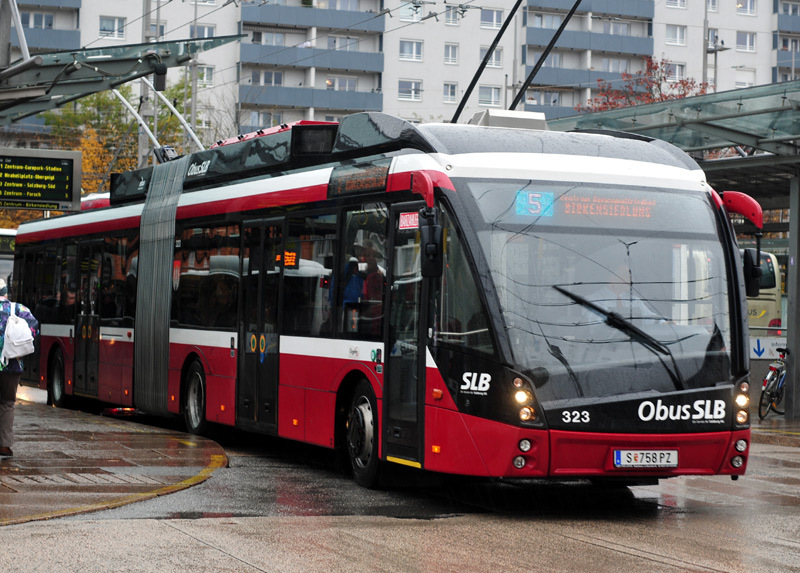 Salzburg has found that it takes just 18 months to convert a diesel bus route to trolleybuses - including all the planning and installation works. 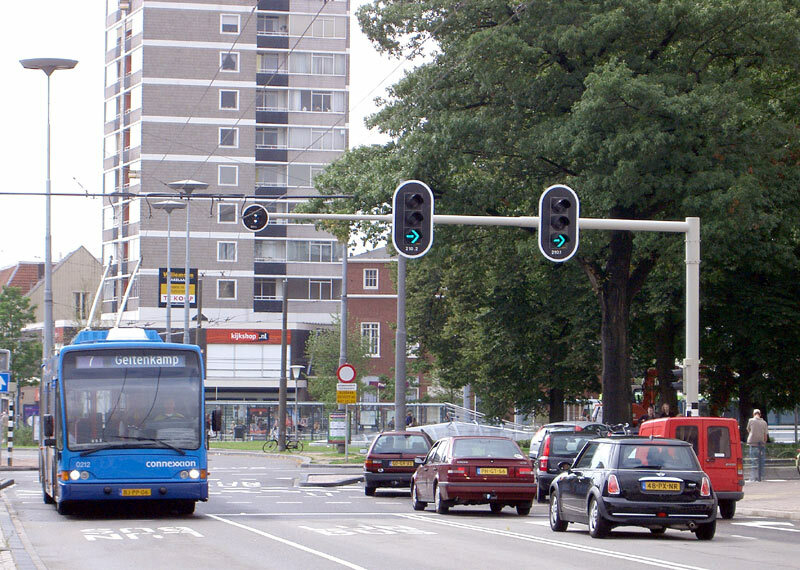 In Arnhem, Holland the "Trolley 2000" transport plan has seen the creation of much reserved lane transport corridors, giving buses the same degree of priority and protection from traffic congestion as other cities give street running trams / light rail. 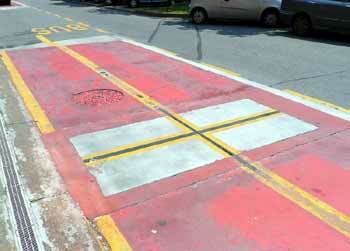 Note the special (white / amber / red 'dot') traffic signals - a feature usually only found on tram systems. (This image shows the signals in white dot mode - click the image to see more easily ). Arnhem has found that a service which is busy enough to justify a bus every 10 minutes - six buses an hour - is cheaper to operate with trolleybuses than motorbuses. Only one city is known to have ever actually asked its passengers their modal choice preference. This was San Francisco in the USA. Their passenger survey found that whilst the streetcars (trams) are the overwhelming 1st choice - even for routes where they are not a viable proposition - the electric trolleycoaches* are considerably more popular than the motorbuses, which are actively disliked, being rated as noisy and smelly. Indeed when roadworks caused temporary motorbus substitution of some electric bus services (with service frequencies and journey times remaining unchanged) there was an 11.33% downturn in passenger patronage that can only be explained by passengers making a pro-active choice to avoid the motorbuses. *In North America many people refer to what we call a trolleybus as a trolleycoach. San Francisco, USA - passengers like their electric street transports (modern streetcars, historic streetcars and trolleycoaches) - and given a choice pro-actively avoid motorbuses, which they rate as being noisy and smelly. Along with reduced air pollution another advantage of the electrical power supply infrastructure is that it would act as a continuous advertisement for the system and help instill confidence that the transport will be here today - and tomorrow(! ), thereby encouraging businesses to make investments in the served corridors. Here in the UK experience gained from railway electrification has shown that the sparks effect does attract more patronage, even when (as in Yorkshire) hostile Government policies meant that the passengers had to use 30+ year-old hand me down trains. Based on this plus the experience in America, Austria and Holland quoted above it is reasonable to expect increases in passenger numbers on any British diesel bus routes which are converted to electric traction. The reasons why passengers prefer electric transports include that their better overall performance, less vibration (none whilst idling!) and lack of engine smells results in a faster, more comfortable, smoother and hence more attractive journey experience. Potentially Financially Beneficial for NHS, Treasury and UK Taxpayers! Admittedly there is a challenge in that HM Treasury and most of our City-quoted transport groups are only interested in finances which involve the lowest headline costs in the shortest possible term and highest immediate profits, rather than what works out to be the most cost effective over 15+ years. This needs to change! London Buses Ltd in its 2001 publication "Cleaner Air for London - London Buses leads the Way" estimated that the cost of (human) health care which results from diesel bus air pollution equates to an equivalent of 13 pence (approximately €0.20 [20 Euro cents]) per kilometre. Meanwhile, a report prepared at the Roma Tre university in Rome, Italy, suggested the cost as being €1.20 per km. As most readers will instantly note, the Italian figure is significantly larger! Using this figure helped justify the investment in a new "filobus" (the Italian word for trolleybus) service along a severely air polluted transport corridor in Rome. In short, it suggested that installing the electric street transports would result in significant financial benefits (through reduced health care costs) to the Italian NHS - and by extension to the Italian Treasury and to Italian tax-payers. The clear implication here is that investment funds spent here in the UK on the electric street transports will save our NHS money... year after year. Furthermore, if it means that fewer family breadwinners become unwell then it will result in people who would have needed social security benefits remaining in employment as tax payers. Fewer incidences of ill-health also result in many emotional and familial benefits which cannot be counted financially. The electricity to power our electric street transports has to come from somewhere and since humankind does not (yet) know how to cleanly and safely extract it from the Ether so it is frequently sourced at coal, natural gas or nuclear power stations or from renewables - solar, wind, wave, hydro, geothermal, etc. The European canals which in the first half the 19th century used overhead wire electrification for electrically powered barges sourced their energy from sluices / turbines at the locks. At one time wind generation was believed to represent the best of the renewable options for us in the UK, however whilst it probably is viable for low-power domestic micro-generation, real-world commercial experience has shown that triple-bladed wind turbines rarely meet the generating capacity expectations that their promoters promised. It is very likely that someone, somewhere, has devised a commercial wind power generation system which actually works far better than the three-bladed wind turbines upon which so many people (mis-)place their faith. Just because the UK is facing an energy shortage is not the reason to avoid replacing buses that emit much harmful fossil-duel derived air pollution into our urban environment (ie: the streets in which we live and breathe) with clean electric buses and trams that do not emit any tailpipe pollution at all. Of course it would have been better if the British electric generation and supply industry had benefited from proper long-term planning so that the energy shortage had not arisen. It is indeed total insanity that existing coal fuelled electric generating facilities are being withdrawn without first ensuring that there will still be sufficient generating capacity - whilst it is recognised that coal is a dirty fuel the fact remains that it is still far easier and more effective to scrub waste gasses from the comparative few coal power station chimneys than the many thousands of vehicle tail pipes. Many people see much potential in low-carbon energies such as anaerobic digestion (AD) biogas and bio-methane as sources of energy for use at power stations - in every case even if there is some chimney waste it will still be significantly less damaging to our health than diesel fumes in our streets, lungs, bloodstream, brain, etc. There Is Still A Reduction In Global Air Pollution! Critics often allege that by sourcing electricity from fossil fuels all that is really happening is that the pollution is being shifted up the energy chain to the power station. However, following extensive research in the University of California it has been found that even with low grade coal that produces a lot of carbon dioxide (as is used in Germany) electric traction offers an almost complete elimination of carbon monoxide and hydrocarbons, resulting in a significant global air quality benefit. Of course if the fuel used is high grade coal, natural gas, biogas (or another so called 'cleaner' fossil fuel) the benefits are even more admirable. Experience in Sweden has shown that when a type of coal-burning power station known as 'pressurised fluidised-bed' is used then the emission of sulphur oxides and nitrogen oxides are also considerably reduced; furthermore, when these facilities are linked in with combined heat and power facilities (ie: provides both electricity and hot water which can be made available to industrial and domestic consumers alike) then they are about 40% more efficient than their traditional large coal burning equivalents (ie: 75% efficient opposed to 35% efficient) and are so clean that they can be located within cities. In January 2015 London's Mayor announced plans to re-commission the 1906 Greenwich Power Station which had previously supplied electricity for London's electric trams and underground trains. The future plans are to burn low carbon natural gas and also provide heat for local homes and businesses. This facility could also be used to power future tram and trolleybus networks! It should also be remembered that with trams and trolleybuses the electric motors only consume energy when accelerating - and not whilst the vehicle is stationary. When slowing they actually produce electricity which can either be recycled into capacitors (for re-use when accelerating) or returned to the overhead wires for other nearby vehicles to use. Sometimes natural gas is sourced by a method known as fracking. There is growing evidence that this destabilises the ground, damages local water tables, contaminates drinking water and has other undesirable local geophysical effects. In addition, whilst at the present time fracking may be financially profitable it leaves the children of today a damaged, polluted landscape for their tomorrow. Surely the rules of global stewardship include that one generation should leave the planet for the next generation in (at a minimum) as good a state (ie: condition) as it was when they received it from their parents? Many countries source electricity using nuclear power, although what happened because of the melt-down of several of the Fukushima reactors in Japan has alarmed so many previously unaware and disinterested people that there is a growing opposition to more nuclear power stations. If this comment leaves readers somewhat perplexed then this is a result of the British media not reporting the seriousness of the melt-downs, nor that even in 2015 large quantities of toxic radioactive material is still being discharged into the open seas, endangering all life in the entire Pacific Ocean - and those people who eat fish from there. Nuclear power generation also leaves much radioactive waste material which could be described as an obnoxious, poisonous gift that this generation is bequeathing upon the next generation. It is understood that whilst it is possible to process and reprocess nuclear waste until it is actually safe, and gain much extra electrical energy whilst doing so, there is a rarely-spoken reason why this is not allowed to be done. This could be military and be connected with nuclear weaponry. Some people advocate Thorium as a safer alternative to uranium, some even suggest that as with what is known as cold-fusion there are powerful people in established very wealthy fossil-fuel industries who stand to lose too much to allow any true alternative (that is not already being used) to be commercialised; it is beyond the scope of this page to say any more on this topic. In January 2009 a report in The Guardian newspaper revealed that between 2005 - 2007 the air 'quality' in Britain had been so poor as that it constantly broke British air quality laws - yet alone the EU regulations. Not just in a few larger cities, but in as many as 20 conurbations nationwide. In addition it was revealed that as a result the EU was planning to prosecute the British government for failing to take appropriate actions to reduce urban air pollution. In February 2010 the House of Commons Environmental Audit Committee was informed that the fatality rate is actually at least 35,000 people a year, and based upon some EU studies possibly even as high as 51,000 people a year. When (in 2011) the House of Commons Environmental Audit Committee released a report about air pollution some of its members went as far as to suggest that by its actions [or rather; in-action] the impression gained is that despite the seriousness of urban air pollution situation the government just does not care about air pollution and its effects on human health. This uncaring indifference gives rise to the question whether [despite being the British Government] our top politicians actually serve someone else; ie: not the British people?! "The Government is putting thousands of lives at risk by trying to water down EU air quality rules instead of prioritising action to cut pollution on UK roads"
"It is a national scandal that thousands of people are still dying from air pollution in the UK in 2011 and the government is taking no responsibility for this. It is often the poorest people in our cities who live near the busiest roads and breath in diesel fumes, dangerous chemicals and bits of tyre every day. If you have heart disease, asthma or other respiratory illnesses then living near a congested road like this can literally take years off your life. "The latest figures suggest 29,000 people die prematurely from it every year in Britain, twice as many as from road traffic, obesity and alcohol combined, and that air pollution is now second only to smoking as a cause of death". "In 2011, the House of Commons Environmental Audit Committee calculated that living in an air pollution hot spot could shave nine years off the lives of the most vulnerable people. It concluded that it cost Britain £6-19bn a year, or up to 17% of the total NHS budget, and that 15-20% more people died prematurely from it in cities with high levels of pollution than those in relatively cleaner ones. In effect this Supreme Court ruling confirms that 60 years after the clean air legislation of the 1950's resulted in the ending of coal sourced smogs the air that we breathe in our towns and cities is yet again so heavily polluted that yet again large numbers of people are suffering ill health and even dying from it. It could be asked why our predecessors bothered, only to be failed by future generations. 2015: Back To The Supreme Court! Because the response of the government was deemed to be inadequate in April 2015 the Supreme Court quashed the government's existing plans and ordered it to produce new ones by the end of the year. So In 2016 Can Expect To Find Itself Back In A Court Of Law! Electric (trolley)buses and trams would help alleviate the problems of air pollution - not just in the street domain but also within the wider global context. The House of Commons environmental audit committee says that carbon emissions from transport are 'still moving in the wrong direction' but apart from clobbering motorists with yet more taxes the politicians have failed to find effective ways to entice people out of their cars and on to buses. (In many areas trains and trams have proven to be more successful, but there are many urban transport services for which only buses will ever prove to offer a financially viable solution). A nationwide programme of bus electrification here in Britain would help us justify to the other members of our planet-wide family of nations of the urgent need for similar policies for improving both the global and their local environments. It would also "add value" to people's daily lives - something which current British government transport & environmental policies totally fail to do. How Quickly Could The First Services Be Operating? In summer 2003 the Swedish city of Lanskrona opened a new trolleybus route which had been planned, installed AND opened within just one year of the politicians deciding to install it. Admittedly this was a short route, but it still compares very favourably with the British planning process which encourages paralysis by analysis! Therefore there is a need for a legal framework which would permit the conversion of existing diesel bus services without needing a public inquiry and Transport and Works Act Orders to authorise every inch of overhead wiring. 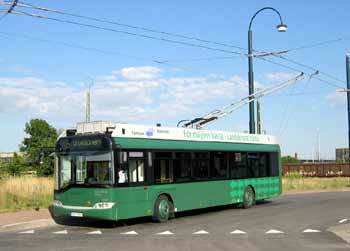 Trolleybuses do not need roads digging up along the entire length of the service. 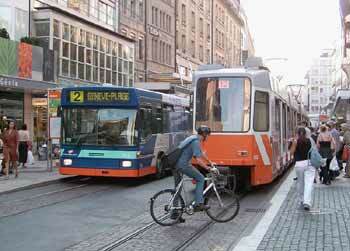 For trams this is necessary, so the planning and installation stages will take longer. Even before it reached the public inquiry stage the Leeds NGT scheme had become a classic example of both how the British planning system encourages paralysis by analysis AND how the British Government's transport policies suggest that it is actively hostile to issues related to human health and air pollution. NGT really should have been built and opened by April 2015 Instead, it still awaits approval (January 2016). It is important to understand that the NGT proposals are for something more than a simple trolleybus service. The NGT plan is actually for brand new BRT (Bus Rapid Transport) service that will use trolleybuses rather than diesel buses (ie: TBRT). People who know Leeds will likely have heard of the bus services which for parts of their routes use the kerb guided busways, which effectively are specially-built short sections of bus-only traffic lanes. The NGT system will be similar in theme except that the specially built dedicated traffic lanes will be much more extensive and the bus driver will still steer the vehicle. The trolleybus aspect of NGT represents only 10% of the entire project cost. However a city the size and importance of Leeds justifies more than just the one electric street transport service. To be effective in reducing air pollution throughout the city of Leeds the electric transports should serve the entire city in an extensive network of tram and trolleybus routes. This would include all bus services which use the high profile kerb guided busways being converted to trolleybus operations. In August 2003 the Swedish town of Landskrona opened a completely new trolleybus service which had been successfully designed and installed in just one year from when the city council voted for it! What a contrast this makes with the British planning process which encourages paralysis by analysis!!! Image & license: Carl-Johan Aberger / Wikipedia encyclopædia. Public Domian. http://commons.wikimedia.org/wiki/Image:Tr%C3%A5dbuss_Landskrona.JPG. As part of its plans to reduce severe urban air pollution the Chinese government is encouraging its cities to invest in electrically powered trams and trolleybuses. This new Beijing trolleybus has just connected to the overhead wiring after travelling on a short unwired section of route, as described below. It is possible, if absolutely necessary, for both trams and trolleybuses to use onboard energy storage to travel along short sections of unwired roadway. Typically this could be done at very busy junctions where many routes meet and diverge, as an alternative to installing what would otherwise be very complex overhead wiring. Since capacitors are expected to last the entire life of the vehicle then these could represent the preferred medium of energy storage. Many of the latest designs of trolleybus (and some modern trams) are already fitted with capacitors which they use to reduce overall energy consumption by storing braking energy so that it can be recycled (re-used) when accelerating. They use capacitors because these are significantly more effective than batteries at this function. Trolleybuses, electric buses, air pollution and why so called "cleaner" diesel (aka "less dirty") buses could be worse that buses which give off visible smoke are looked at on the Electric Buses pages from the "citytransport.info" website. 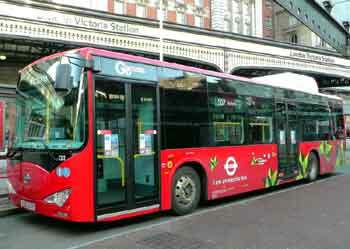 This link leads the page on the Citytransport.info website which looks at the different types of diesel hybrid buses. This link leads to a four page letter which was sent (in 2004) to almost 100 elected officials from both local and national governments when a DEFRA air pollution survey found parts of suburban London to be the most polluted localities for NOx in all of the UK. This link will open the "citytransport.info" website's front page. This link leads to the Light Rail Transit Association's website, where more information on light rail / trams can be found. To avoid taking you away from this web page the above links all open in new web browser windows.